The Dune Climb is undoubtedly the most popular spot in Sleeping Bear Dunes with more than 300,000 people climbing it annually. This open dune forms the eastern edge of the Sleeping Bear Plateau, a 4 square-mile field of perched dunes that extends to Lake Michigan to the west and Sleeping Bear Point to the north. Most visitors are content with just climbing the dune, but departing from this picnic area are two trails. Skirting the base is the Duneside Accessible Trail, a paved, interpretive path. 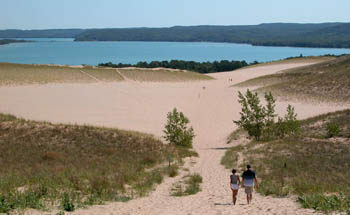 Departing from the top of the Dune Climb is the Dunes Trail, a 1.8-mile trek across the perched dunes to Lake Michigan. The Dune Climb is undoubtedly the most popular spot in Sleeping Bear Dunes with more than 300,000 people climbing it annually, the vast majority during the summer. This open dune forms the eastern edge of the Sleeping Bear Plateau, a 4 square-mile field of perched dunes that extends to Lake Michigan to the west and Sleeping Bear Point to the north. Most visitors are content with just climbing the dune, but departing from this picnic area are two trails. Skirting the base is the Duneside Accessible Trail, a paved, interpretive path. 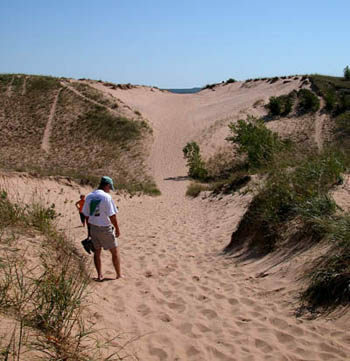 Departing from the top of the Dune Climb is the Dunes Trail, a 1.8-mile trek across the perched dunes to Lake Michigan. During the summer a steady stream of hikers follow the Dunes Trail – via a series of blue-tipped posts - but unfortunately many of them start out shirtless, hatless, and, worst of all, shoeless, and never reach beautiful Lake Michigan at the end. They soon discover that trudging through soft sand up steep dunes in the hot sun is not the same as walking down a beach. This hike is challenging. If you have trouble scaling the Dune Climb at the beginning think twice before continuing on as you will have to climb five more dunes of various heights. Halfway out to the lake you’ll be greeted with a view of South Manitou Island from the crest of a dune and should be able to even see its 100-foot-high lighthouse marking the entrance of Manitou Passage. But for those who come prepared with walking shoes, sunglasses, a wide-brimmed hat, sunscreen, and water, the Dunes Hiking Trail can be a most unusual trek during the summer. The rolling dunes are beautiful and vary in cover from open sand or patches of beachgrass and wildflowers to a lone cottonwood here and there. The hike is a workout for many people, but the isolated beach along Lake Michigan and its refreshing surf is a great place to recuperate before heading back along the same route. A recent addition of this trail is a shipwreck that doesn't require scuba gear to view. 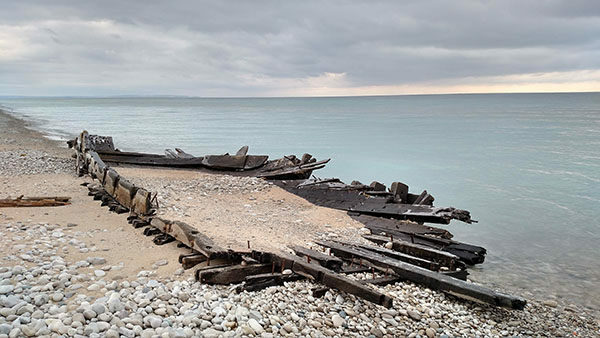 In 2014, a November storm left behind the biggest shipwreck ever to appear on the park’s mainland shoreline, measuring 14 feet wide and 43 feet long and includes ironwork. Historians believe it is part of the James McBride, built in 1848 and lost in October 1857. The remains of the wreck are on Lake Michigan 300 yards south of The Dunes Trail. 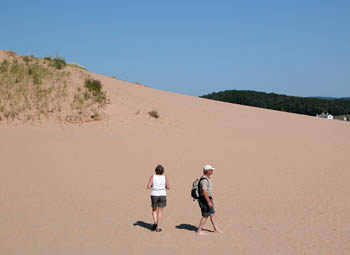 The steep slope of the Dune Climb is only a few yards from the parking lot, store, and restrooms. It's a knee-bending ascent up the famous Dune climb, a sandy slope of 45 degrees that rises 130 feet above the picnic area. Take your time, and remember that you are supposed to feel winded on the way up. At the top, catch your breath and enjoy the spectacular view of Glen Lake and the rolling farmland that surrounds it. At the top, a sign posted "Dunes Trail" clearly points the way across a sandy plain, where the first blue-tipped post appears. Soon you're faced with a second dune but not nearly as steep as the Dune Climb. At the top, you get your first view of the Great Lake. From this high point, you descend quickly, only to climb another dune. From here you get a much better view of what lies ahead, a rolling terrain of dunes covered with sparse beach grass. For the next mile, you follow the posts, climbing up and down hills of sand. Eventually, you scale a dune and are greeted with the best view of South Manitou Island, on Lake Michigan's horizon. You can even see the island's historic, 100-foot-high lighthouse, built in 1871 to mark the entrance of Manitou Passage. At this point, the trail descends, makes one more short climb, and then crosses a somewhat level area for a half mile. Throughout much of June, this area is colored with wildflowers ranging from the bright yellows of hoary puccoon to the distinct oranges of wood lilies. You don't see the beach until you're almost in the surf, but near the end of the trail the breeze becomes cooler and the sound of the surf is more distinguishable. Suddenly you're on a low bluff, looking straight down at the water and the wide band of sand making up the beach. Most people flop down on the beach right at the end of the trail, but if you walk in either direction, you should soon have a stretch all your own. To see the James McBride shipwreck, head south 300 yards south once you reach the shoreline. To return, backtrack to the last blue-tipped post and retrace your steps. The Dune Climb has a large parking lot and picnic area with tables, grills and drinking fountains. There is also a concessionaire store and restrooms located here. Almost directly across M-109 is another day-use area with a beach and picnic area on Glen Lake. The trail is open year-round and all visitors are required to have a weekly vehicle entrance permit, an annual park pass or a per-person pass if they arrive on foot, bicycle or motorcycle. Passes can be purchased at the parking booth during the summer or from the Philip Hart Visitor Center in Empire. 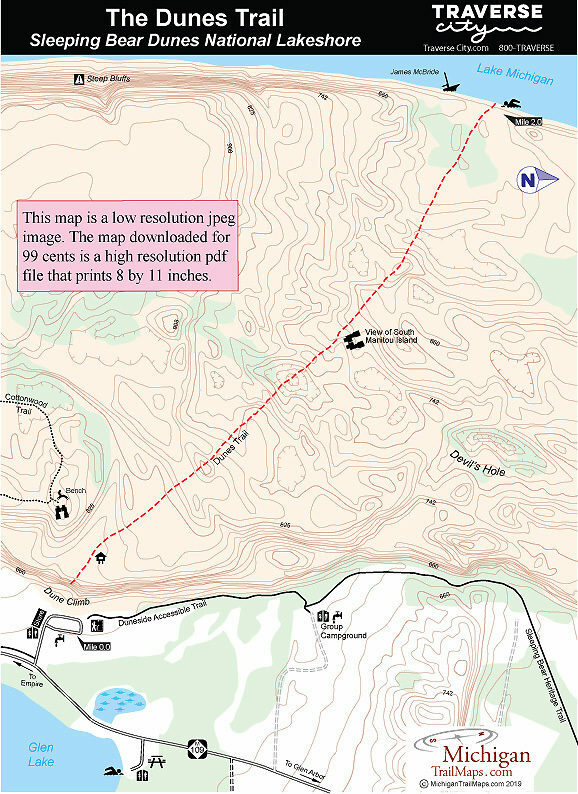 At the corner of M-72 and M-22 in Empire, or 22 miles west of Traverse City, head north on M-22 and then veer left onto M-109 to reach the Dune Climb in 6 miles. Call the Philip Hart Visitor Center (231-326-5134) or check the Sleeping Bear Dunes National Lakeshore website (www.nps.gov/slbe).